Our Saturday Evening Post collection features three vacuum-sealed tins in a clear acetate gift box. One 10 oz. tin of Salted Virginia Peanuts, one 11 oz. tin of Celebration Snack Mix, and a 10 oz. 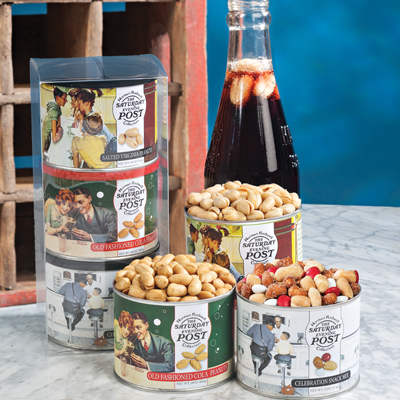 tin of our NEW Old-Fashioned Cola Peanuts. The quality far exceeded my expectations!! As always, Va Diner provides an excellent product with wonderful customer service. Never had a problem. I placed an order based on the delivery date stated on the website...even paid extra for faster delivery. 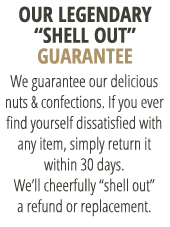 After that date had passed, I called to inquire and was told my order was still being prepared and hadn't shipped. I had to purchase alternate gifts for my co-workers. My complaint is not that it took 2 weeks to travel 90 minutes by road but rather that the website was misleading and false. Please be more accurate in the future.